Match odds from BetVictor show Swindon Supermarine as 7/10 favourites whist Walton are 31/10 to win! 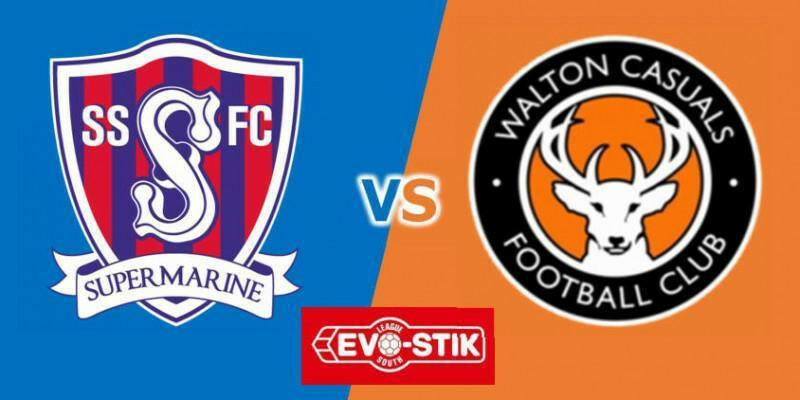 Swindon Supermarine face relegation-threatened Walton Casuals in a must-win game for both sides at the WebbsWood Stadium this Saturday afternoon, writes Nick Taylor. Having lost to a controversial penalty away at leaders Weymouth last weekend, Lee Spalding’s Marine side need to bounce back to winning ways, having now slipped down to twelfth in the standings, on 48 points, only six points ahead of their visitors, who find themselves just one place above the drop-zone, currently held by Gosport Borough who sit in the last relegation spot on 40 points. Walton arrive in Wiltshire having not won in three matches, suffering a 2-3 home loss last Saturday to Dorchester Town, but will be buoyed by the fact that they beat Marine by 3-1 when the two sides met on their impressive 3G pitch back in mid-September, although it be said that this was one of Marine’s poorest performances of the season! Connor Thompson is still missing through injury but Brad Gray who hasn’t played since November looks set to return to the Marine squad after training for the last few weeks, along with Calvin Dinsley who missed last weeks game after rolling his ankle in training. With Martin Horsell serving the third of his four game ban, Josh Hill continues in goal and will look to put in another solid performance as he did in the last two games. Two for One Day… Bring along a guest with you and one of you will get in FREE!